Battery-operated model ESP-710 punches multiple holes in 16-20 gauge, load bearing, structural metal studs. Weighing 9.2 lb, tool can punch up to 200 holes per battery charge. 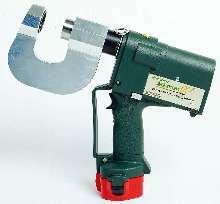 Portable stud punch can be operated with maximum capacity to punch 1.34 in. dia holes in 16 to 18 gauge steel structural studs 2Â½ in. and wider. Tool can also be used to allow contractors to cut holes to install Â½, Â¾, or 1 in. conduit. New tool can punch 16-gauge structural studs in 5 seconds ROCKFORD, Ill. - Greenlee now has a battery operated stud punch for use when multiple holes in 16 to 20-gauge load bearing structural metal studs are needed in commercial and industrial settings. The 9.2-pound ESP-710 tool can punch a hole in a 16 gauge structural stud in five seconds and has the capacity to punch 200 holes per battery charge. The tool comes with two batteries to help eliminate downtime. There's also a 230-volt battery operated stud punch to meet the needs of the international market. The portable Greenlee battery stud punch can be operated with a maximum capacity to punch a 1.34 diameter hole in 16 to 18 gauge steel structural studs 2½ inches and wider. "The battery stud punch is designed to make a lot of holes in 16-guage steel structural studs typically found in industrial and commercial sites around the perimeter of a building," said Ken Hagemeyer, director, product manager. "This tool saves time and money by allowing the contractor to quickly cut holes to install ½, ¾, or 1-inch conduit with the use of Greenlee 712 bushings." For more information about the battery stud punch, and other products from Greenlee, contact your Greenlee representative, distributor, or the Greenlee web site at www.greenlee.com. You can call 1-800-435-0786 in the US and 815 397-7070 in Canada. Textron Inc. (NYSE: TXT) is a $12 billion multi-industry company with more than 51,000 employees in 40 countries. The company leverages its global network of businesses to provide customers with innovative solutions and services in industries such as aircraft, fastening systems, industrial products, industrial components and finance. Textron is known around the world for its powerful brands such as Bell Helicopter, Cessna Aircraft, Kautex, Lycoming, E-Z-GO and Greenlee, among others. More information is available at www.textron.com.